We’ve got a hawk of some sort who’s a frequent visitor to the grounds outside the alumni center. Today he (or she?) spent about a half hour on a tree branch outside Ryan Jones’ office, and then it moved to the top of the pergola outside our main entrance, where it sat for another good hour. There were plenty of students walking along the sidewalk below it, but the hawk seemed unconcerned about the students—and vice versa. I took this photo with my back to the Electrical Engineering Building. 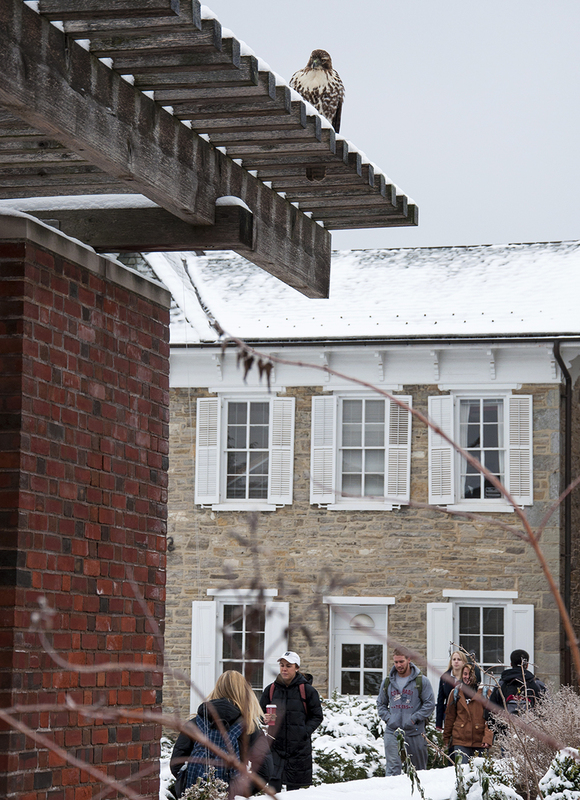 The stone building you see is the old president’s house, which is part of the Hintz Family Alumni Center. As always, click on the photo for a bigger and crisper version. And if you can ID the species of hawk based on what little is visible here, I’ll be very impressed. Entry filed under: Students. Tags: hawks. He’s after the fish in your pond … I know they get mine in my backyard ponds … along with raccoons, cats, snakes, snapping turtles … well, you get the picture, ha! Red tail hawk…if it’s the same one who was there about two weeks ago, it’s an immature red tail. Steve, I think you’re right! He’s probably not above snacking on a squirrel or a songbird, either. True Tina … like the animal control officer told my wife when she reported a black snake getting at a woodpecker’s nest in our front yard, “sorry lady we can’t do anything for you nature has to take it’s course!” … my wife’s answer, “yes, but not in MY front yard!” ha ha! Ilene is right – it is a juvenile red-tail. And it is probably quite the small mammal catcher, so any mole, vole, mice problems should be greatly reduced! Are we sure its not a peregrine falcon? Are we sure its not a peregrine falcon? They normally will not oerch this low to the ground, so I’ll go with the Red Tail Hawk. It’s definitely not a peregrine falcon. The facial markings are not right for a peregrine.